Work-related musculoskeletal disorder (WMSD) prevention measures have been studied in great depth throughout various industries. 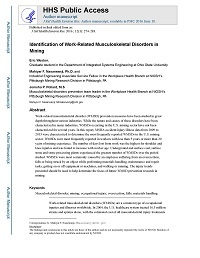 While the nature and causes of these disorders have been characterized in many industries, WMSDs occurring in the U.S. mining sector have not been characterized for several years. In this report, MSHA accident/injury/illness data from 2009 to 2013 were characterized to determine the most frequently reported WMSDs in the U.S. mining sector. WMSDs were most frequently reported in workers with less than 5 years or more than 20 years of mining experience. The number of days lost from work was the highest for shoulder and knee injuries and was found to increase with worker age. Underground and surface coal, surface stone and stone processing plants experienced the greatest number of WMSDs over the period studied. WMSDs were most commonly caused by an employee suffering from an overexertion, falls or being struck by an object while performing materials handling, maintenance and repair tasks, getting on or off equipment or machines, and walking or running. The injury trends presented should be used to help determine the focus of future WMSD prevention research in mining.